The dual layer edge band has two layers; the inside band color will be the color of your design; the outside color is actually a stripe around the band and shows off the inside layer of color above and below the stripe. You can design your debossed wristbands where your text will be recessed into the band. This effect makes your message stand out more. 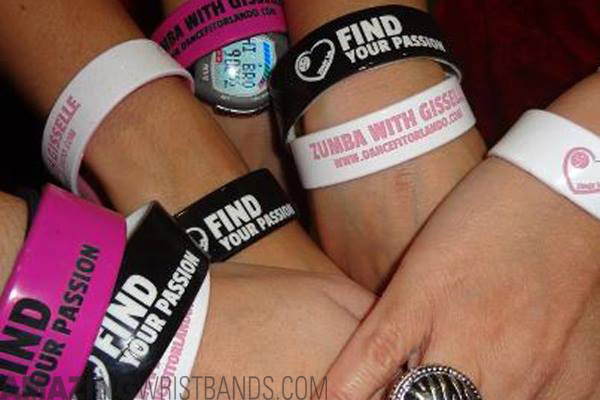 Our attractive embossed wristbands are for those of you who want their artwork/message raised above the band. We offer a wide range of standard color selections. Our Pantone Color Chart will best assist you in selecting the correct shade. You can add cool and fun effects such as glitter, glow in the dark and our special UV glow specifically designed for white bracelets. When your band goes under UV light, the color of the band changes to purple. We have a beautiful online collection of designs (1000+ clipart designs and 300+ fonts) for you. You can also upload your own custom artwork and/or fonts. Besides 1/2" standard wristbands, we also offer 1/4" thin, 3/4" wide, 1" extra wide bands, silicone rings, slap bands and keyrings. In case you’re not sure about the size you need, then adjustable bands are perfect for you. These bands have three buttons that can be adjusted to a smaller or larger size. NO MOLD FEE on any quantity of custom bracelets! Have your order in 5-7 business days (for some products)! Get a detailed quote in minutes! Call us at 1-800-269-0910 to speak with our reliable customer service team or e-mail us at customercare@amazingwristbands.com. You can also visit us on www.AmazingWristbands.com and check out our online customizers! We're sure you won't be disappointed with what we've got to offer.